My girlfriend and I have a layover at the Mumbai airport from 19:35 to 05:55 and we would like to sleep in a cheap place near to the airport (maximum 30 minutes away). Is there any cheap hotel near there? Or any cheap lounge where to sleep well? (flight at 05:55 is an intercontinental flight and we prefer to stay "fresh"). If not possible, is the airport a safe place to sleep? Sleeping In Airports has a page on Mumbai (Bombay). It's handy to note that as a traveller, there IS free wifi in the airport. If sleeping in the Mumbai Airport does not appeal to you, there are hotels near the airport..
Sahara Star - opposite the Domestic Airport. Day rooms are available for 6 hours from 9am - 9pm. Hotel Airport International - 2 minute walk from the Domestic Airport. Hilton Hotel - 5 minutes from the International Terminal. After looking on Hostelworld, there's another option which is cheaper. The Anjali Inn offers free airport pickup - so even though it's a few kilometres away (5km from domestic airport, 1km from international), it won't be hard to get there. It sounds like, from the reviews there that there's food facilities and decent chairs, but there's not much space land-side at the domestic terminal, and that heading to the international terminal would be your best bet if you decide to sleep at the airport. Otherwise, one of the hotels mentioned would be a good option. 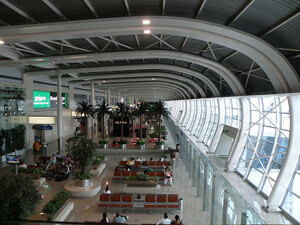 I had a 5:30 AM departure two weeks ago from Mumbai international airport. Before checkin, my options for a nap were very limited, even very few chairs available. However, my checkin opened up around 1 AM, which seemed to be fairly typical for early morning flights. After checkin, there are plenty of seats and some recliners, but, on my visit, most if not all were occupied, due to almost everyone arriving very early for their early morning flights. The airport, both before and after checkin, felt decidedly safe. Besides the hotels Mark mentions, there's the budget Anjali Inn, which is right next to the airport, getting good reviews and is as budget as you'll get in Mumbai. I considered staying here, but, with nearly two days to spend before my flight, I opted for a hotel right next to Victoria Terminus (the main train station), where I entered Mumbai. Not the answer you're looking for? Browse other questions tagged india airports sleeping mumbai bom or ask your own question.